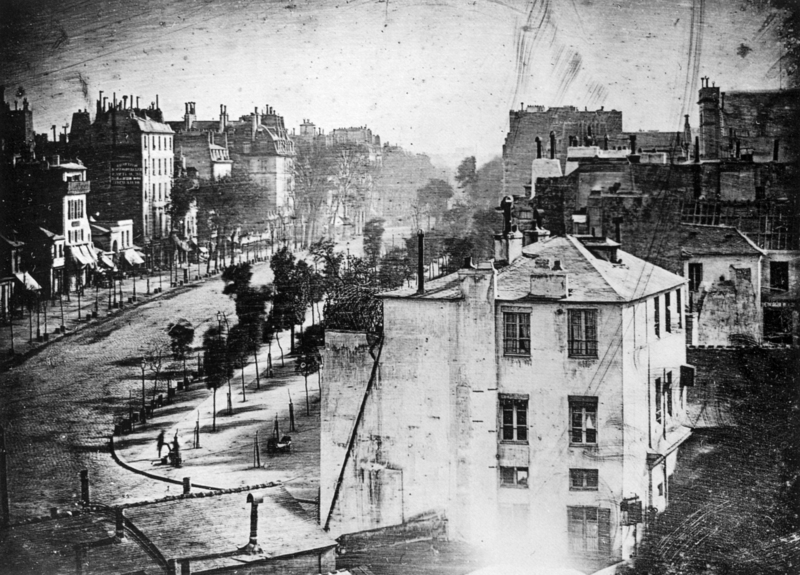 Here’s an account of one of the first public photographic demonstrations by Louis Daguerre in 1839. This mysterious new process was documented by a special correspondent of The New York Star who had travelled to Paris to view Daguerre’s performance. ‘[Daguerre] took a plated of copper plated with silver and rubbed the silver surface in a slight manner with very fine pumice powder and sweet oil, using small ball of cotton wool for this purpose. He thus completely dulled the surface, and I noticed that he rubbed first with a circular motion, and then with straight lines from top to bottom. He then washed the plate thus dulled in a liquid consisting of: distilled water, 16 parts; nitric acid, 1 part. He then gave a slight heat to the plate by passing it over the flame of a lamp – the copper side being next to the flame and the silver surface uppermost. He then washed it a second time in a dilute nitric acid. The plate was now ready for a coating of iodine. The apartment was darkened, and the plate, fixed on a small board, was placed (with the silver part downwards) over an opening the size of the intended picture, in the lid of a box at the bottom of which the iodine was. Half way down the box was a slight wooden frame on which a piece of muslin was strained, and through this muslin, as the iodine evaporated, the fumes rose, and were thus equally received upon the silvered surface, there forming a coating of iodide of silver, having the yellow appearance of brass. A camera obscura was now brought up. Its focus had previously been adjusted by trying the effect of the picture on a bit of ground glass. The plate prepared as above was placed in the camera. The view intended to be taken was the Tuileries, the Quay and the Seine in front of the window where the camera obscura was placed. It was there to remain until the action of the sun’s rays on its surface was sufficient. This occupies a time from five to forty minutes, according to the time of year and the state of the weather, and as the director (for I cannot call him the operator) cannot see by the plate how the process goes on, experience alone can tell him how to judge as to the advancement which the action of light has made. In this instance the day was dull, and the plate remained fifteen minutes in the camera obscura. When it was taken out it appeared exactly the same as when it was put in, and people looked very blank, I do assure you, at what looked like a failure; but indeed one could scarcely tell whether or not it had been marked, for the process requires that no light fall on it before finishing operations. He fixed it then at an angle of 45 degrees, in a box at the bottom of which was an earthen pan holding two pounds of mercury. Under the pan was a lamp, which heated the mercury to 62 degrees centigrade or 117 degrees Fahrenheit, and as the mercury grew hot, its globules arising, combined with the prepared surface of the metal, brought out the picture. In front of the box is a stained glasss spyhole, through which the process is watched, and the moment it was completed the plate was taken out and washed with distilled water saturated with common salt or with the hydrosulphite of soda, heated to a degree below the boiling point. This finished it, and the picture thus literally executed by the sun, was handed about. The image above is a very early Daguerreotype. The long exposure times required to form an image meant that people were usually absent from the landscape. But here you can clearly see a man who has stopped to have his shoes shined. He stayed motionless long enough to be caught by Daguerre and thus became, perhaps, the very first person to be captured by this new photographic art.